Please take note that a copy of the DWS presentation for the below event which was held on the 23rd November 2016 can be downloaded here. 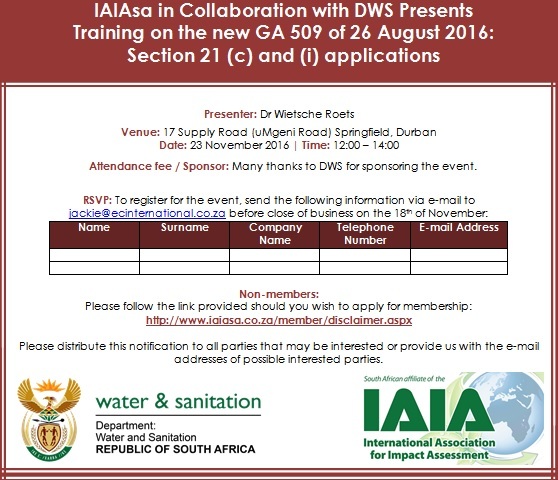 The Department of Water & Sanitation (DWS) invites you to attend a training workshop on the new Section 21 (c) and (i) GA that will be held on the 23rd November 2016 from 12:00-14:00 at eThekwini Municipality Springfield Training Centre (Auditorium), 17 Supply Road (uMngeni Road), Springfield. Please refer to the invitation containing RSVP details which can be downloaded here. A copy of the agenda can be downloaded here. The new GA is attached here for reference.